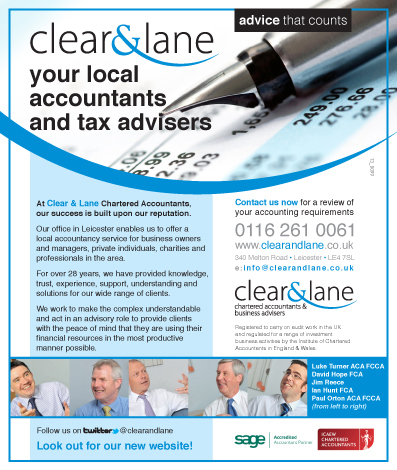 We are proud to be associated with one of Leicester's premier accounting firms. 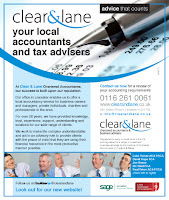 Clear and Lane have been providing top quality accounting advice since 1984 and has grown to become one of the regions top independent firms. We were asked to look at developing a new house style for their advertising. This is always a challenge when a company has a lot to say - especially as all the best adverts we see have a simple key message. This advert is a good example of communicating a large volume of information in a very confined space. We think it gives C&L a fresh new look. If your business needs a fresh new look, please give us a call on 01332 291141 and we can have a chat about how we can help you to generate more opportunities.